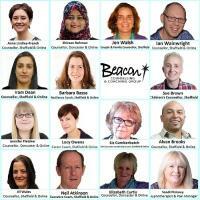 Beacon Counselling & Coaching Group is a team of 15 Counsellors, Coaches and Hypnotherapist offering professional, caring, effective and affordable help in Sheffield, Doncaster and online. Our Counsellors work with adults, couples, children and groups to tackle depression, anxiety, stress, addictions, bereavement and all complex emotions. Our Coaches maximise personal, professional and leadership potential via one-off sessions or programs of support. All calls are answered by Counsellors, so you can be sure that your enquiry will be dealt with sympathetically and confidentially. To find out a bit more, or to discuss which Counsellor/Coach might be best for you, please get in touch. Carr Bank Close S11 is our head office. Our Counsellors and Coaches also work in S2, S4, S6, S7, S8, S9 & S10. Some of our Counsellors and Coaches offer a 10% student discount and a 30 minute free initial telephone consultation. We also run a bursary 3 times a year to offer 6 sessions of free counselling to people who would not otherwise be able to afford counselling.